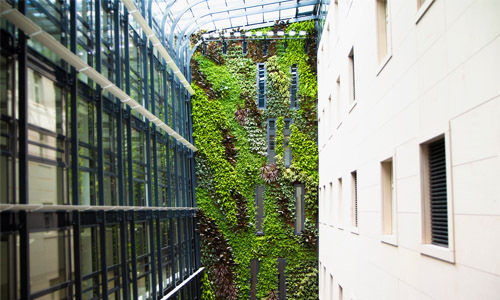 Green walls offer almost limitless design possibilities. Due to variety in constitution, shape and colour of individual plants, it is possible to create separate areas of different colour with smooth transitions as well as colourful ornaments consisting of several kinds of contrasting plants. This generates a dynamic functional image which completes the overall design of the given space. Green wall is not difficult to implement. The choice of suitable place for its placement is crucial – green wall can be placed on existing load-bearing wall or a completely new wall can be built. It is necessary to provide water and electricity supply. The construction of the wall is fast, lasting only few weeks. Exterior design is subject to light and weather conditions. However, these conditions can also be used for interesting effects. Plants adjust their colour and flowering time to changing seasons. This enables creation of impressive design changeable in time. The exterior also allows for use of larger plants, including various types of bushes. 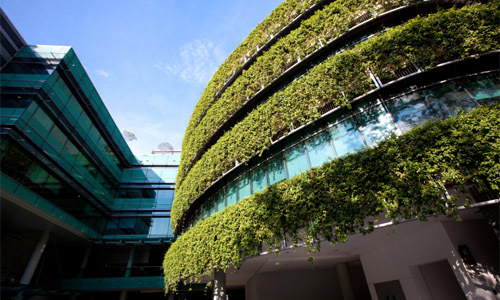 Green wall increases soundproofing of other walls and improves the acoustics because plants and substrate absorb sound which eliminates reverberation. Plants use photosynthesis to absorb carbon dioxide and produce oxygen. If they cover the entire wall, they have significant impact on the quality of air we breathe. Green wall absorbs harmful substances into the air escaping from man-made materials such as plastic, linoleum, adhesives, paints, etc. Combining modern trends and quality materials, we develop our own technology. Its main benefits are high durability and essentially unlimited range. Our solution even offers easy implementation of walls of atypical design. Bearing wall is always equipped with a support system. This system bears growth baskets that are eventually filled with plants. Design solution always includes the irrigation line. As part of our professional service, the walls are equipped with an automatic irrigation system which can be checked via the Internet. The system also monitors the overall condition of plants. Physical maintenance includes trimming, design modification and check-up of the irrigation system.